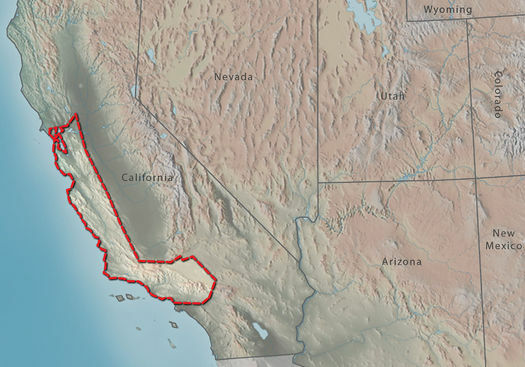 "The topographic texture of western California is controlled by the San Andreas fault system, the tectonic expression of the Pacific Plate sliding northwestward along the western margin of the North American Plate. Hundreds of miles long and in places up to a mile wide, the San Andreas Fault Zone has been active since its origin in the Tertiary. About 10 percent of the present plate motion is compressional, shortening and wrinkling the crust to create the parallel coastal northwest-southeast mountain ranges." cannot be used as a page name in this wiki. The topographic texture of western California is controlled by the San Andreas fault system, the tectonic expression of the Pacific Plate sliding northwestward along the western margin of the North American Plate. Hundreds of miles long and in places up to a mile wide, the San Andreas Fault Zone has been active since its origin in the Tertiary. About 10 percent of the present plate motion is compressional, shortening and wrinkling the crust to create the parallel coastal northwest-southeast mountain ranges. This page was last modified on 7 August 2013, at 12:20.